Iqama/Muqeem is a personal identity card for the expatriates who came to Saudi Arabia for work. When you enter newly in kingdom on a 90 days working visa your sponsor get to manage Iqama (Muqeem card) for you. 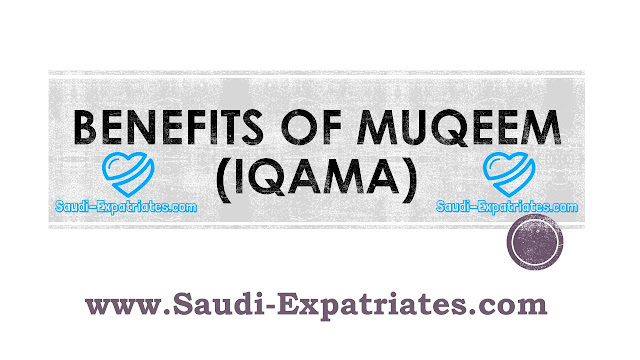 Iqama is a residence permit for expatriates, which is applicable after expiry of your 90 days working visa. 1. Its your Temporary residence permit for working in Saudi Arabia. 2. You can Sponsor your family members on visit or permanent visa if you are from this "benefited professions". Its your sponsor responsibility to get iqama for his employee, if you are on working visa or free visa. 2. Passport with two blank papers and at least 6 months validity. 3. Completed visa application form. 6. Authorization, Power of attorney. 7. Photocopy of signed contract. 8. Attested copy of your education certificates. if im going to exit before the expiration of my iqama(example expiration of iqama is december 25,2015 but iwant to go exit december 5,2015),does my employer have the right to deduct(taking money) my benefits just because i dont want to stay up to the expiration date of my iqama,eventhough my contract is already finish?